The Royal College of Veterinary Surgeons was created by and still exists by virtue of a Royal Charter of 1844. Most of the original charter has been superseded by the Supplemental Charter of 1967. 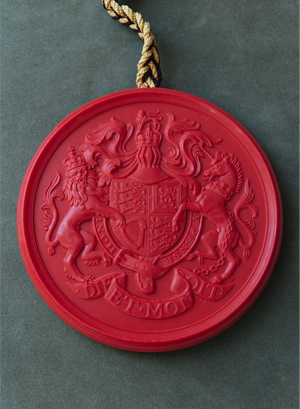 This revoked the Charter of 1844 except so far as its provisions "incorporate the College, recognise the veterinary art as a profession, authorise the College to have a Common Seal, to hold property, and to sue and be sued". A new Supplemental Charter to replace that of 1967 came into operation on 17 February 2015. It does two important things. First it sets the objects of the College, namely 'to set, uphold and advance veterinary standards, and to promote, encourage and advance the study and practice of the art and science of veterinary medicine, in the interests of the health and welfare of animals and in the wider public interest'. The Charter gives the College power to 'undertake any activities which seem to it necessary or expedient to help it to achieve its objects' and mentions a number of specific activities. Second, the Charter recognises veterinary nursing as a profession. It requires the College to continue to keep a list of veterinary nurses, which is to be known as the register of veterinary nurses, and gives registered veterinary nurses - RVNs - the formal status of associates of the College. The Veterinary Nurses' Council is required to set standards for their education, training and conduct. New bye-laws attached to the Charter require the RCVS Council to make rules dealing with the registration of veterinary nurses and the supervision of their professional conduct. The bye-laws attached to the Charter supersede all former RCVS bye-laws, but the RCVS Council is given power to make rules, protocols and procedures related to its activities under the Charter and the transaction of the business of the College. In preparation for the new Charter coming into operation the RCVS Council in November 2014 made rules and a protocol which preserve some of the content of the former bye-laws. Copies of the new Supplemental Charter and bye-laws and the rules and protocol made by the Council may be downloaded from the 'Related documents' box.